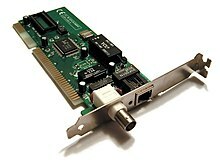 A Network interface card (also known as a NIC, network card, or network interface controller) is an electronic device that connects a computer to a computer network, usually a LAN. It is considered a piece of computer hardware. Most modern computers support an internal network interface controller embedded in the motherboard directly rather than provided as an external component. Network cards let a computer exchange data with a network. To achieve the connection, network cards use a suitable protocol, for example CSMA/CD. Network cards usually implement the first two layers of the OSI model, that is the physical layer, and the data link layer. There are older network protocols such as ARCNET, introduced in 1977, LocalTalk or Token Ring, but today, most network cards use Ethernet. In the 1990s and early 2000s, large Industry Standard Architecture cards were the first standard for PCs. Computer owners had to open the computer's case to install the card. Newer Ethernet cards installed inside desktop computers use the Peripheral Component Interconnect standard and are usually installed by the manufacturer. These cards are still common in desktop PCs, for computers whose motherboards do not contain an onboard Ethernet port. Smaller Personal Computer Memory Card International Association Ethernet cards that resemble credit cards are readily available for laptop and other mobile computers. These insert conveniently into slots on the side or front of the device. The PC Card is a common PCMCIA device, although only certain PC Card and PCMCIA products support Ethernet. By the early 2010s, however, fewer laptops supported the PCMCIA standard. Ethernet cards operate at different network speeds depending on the protocol standard they support. Old Ethernet cards were capable only of the 10 Mbps maximum speed originally offered by the Ethernet standard. Modern Ethernet adapters support the 100 Mbps ​fast Ethernet standard and an increasing number now also offer ​gigabit Ethernetsupport at 1 Gbps (1000 Mbps). An Ethernet card does not directly support Wi-Fi wireless networking, but home network broadband routers contain the necessary technology to allow Ethernet devices to connect using cables and communicate with Wi-Fi devices by means of the router. Ethernet cards ruled when cables remained the primary form of network access. Although Ethernet offers consistently more reliable connections than wireless networking and therefore remains popular as a built-in option for desktop PCs and other relatively immobile computers, mobile devices including laptops and tablets have shifted away from Ethernet and toward Wi-Fi. The expansion of Wi-Fi services in workplaces, coffee shops and other public places, and the decline of wired Ethernet connections in modern hotels, has reduced the access to wired Ethernet for road warriors—and hence, has reduced the need for Ethernet cards. This page was last changed on 8 April 2019, at 17:18.